The Amish Contemporary Writing Desk will draw plenty of attention in your home office, foyer or hallway. The clean lines and strong shapes of this desk design display contemporary style with ease. Writing desks provide room for your writing project while bringing an attractive design to the room. Set up your laptop and work comfortably at this solid wood desk. This contemporary desk is shown here in brown maple wood with an Asbury stain. Brown maple wood is a heavily streaked wood that displays shades of pearly white, chestnut, and khaki. Customize this Amish made writing desk in the wood and stain of your choice. Select the dimensions that fit your space best and consider a drawer or keyboard tray. Be sure to select an Amish Desk Chair to use with this contemporary design. Learn more about desk styles from the writing desk to the executive design in our informative blog post, 8 Office Desks That'll Get Your Job Done. 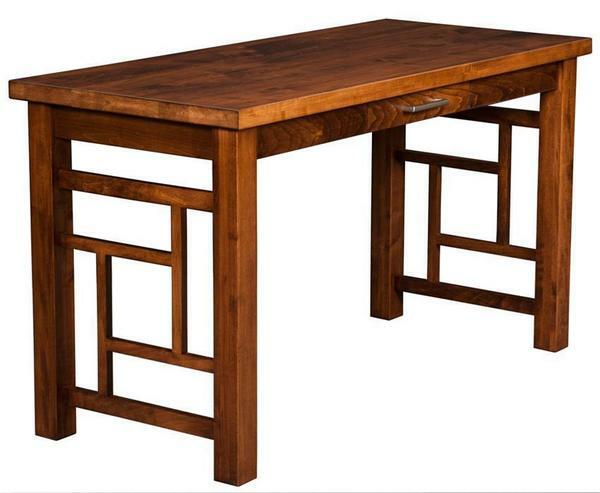 This wood desk can be used in your office, a quiet bedroom corner or as an upscale hallway table to hold mail and keys. Please call one of our Amish Furniture Specialists today, toll-free at 866-272-6773 with any questions. Width: 48", 54", 60" , 66", 72", or 84"
Height from Floor to Drawer Bottom: 25 ½"
Just wanted to let you know that we've received the desk and it's fantastic... we absolutely love it and it works perfectly in the space! We also have the 4 samples from prior to our original order, is there something we can do with those?